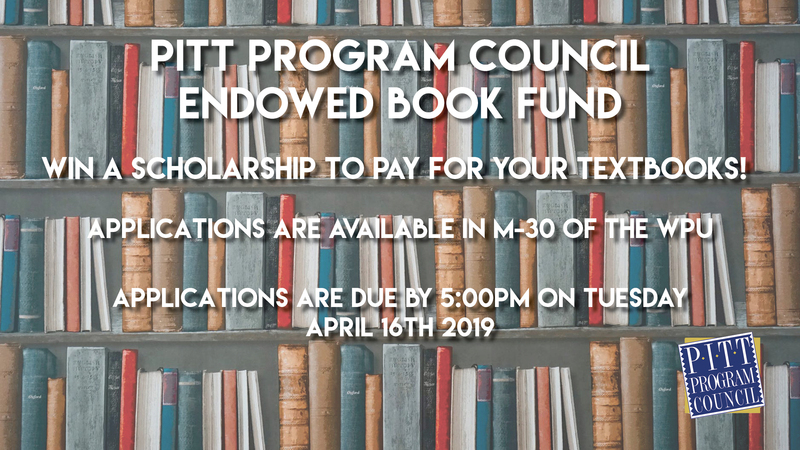 The Pitt Program Council Endowed Book Fund was created in April 2000, by the Pitt Program Council Executive Board, who wanted to give something back to their fellow students. With the help of the Pitt Telefund, we were able to gain the support of parents of current students, alumni, staff, and faculty. The most generous donation was made by Mr. Pat Croce, the former President of the Philadelphia 76ers, who matched our goal of $10,000. This award is intended for students who have been active outside of academic life, and have made a contribution to our campus community. These students may not qualify for financial aid, but are in need of assistance. As a result, an applicant’s financial standing will be discussed in addition to his or hers involvement in campus life. You MUST have a minimum of a 2.75 QPA. You MUST be currently enrolled at the Pittsburgh campus with a minimum of 27 credits completed from the Pitt system at the time of application. You MUST attend the Oakland campus during the term for which you are applying. You may not apply with plans to study abroad. This is a one-time award; previous recipients are ineligible for further award money. Applications will be available in the Pitt Program Council office, M30 WPU and online here and are due by 12:00 PM on Tuesday, April 16th, 2019. Questions about the application should be directed to Farrell Healy at ppcebd@pitt.edu.